Finally... we are up to the last week of 2012! Let's start with Christmas Eve. Of course there was the traditional Christmas Eve program in New Jersey. With Matt's sister and her family joining the East Coast ranks this year, there were lots of extra performers. Ella played her violin and despite our wild applause, burst into tears afterwards because she forgot the ending. That sweet kid just breaks my heart sometimes. She is truly becoming quite a lovely violinist and I assured her that she should be proud of herself. Claire, on the other hand, refused to perform her "violin demonstration" at all. Stinker. And since she's only two, Lucy got a pass to just sit, look cute, and fawn all over her baby cousin Lily. Matt and I truly stepped up our acts this year. I wrote (with Matt's help) and recited my own version of "The Night Before Christmas." Usually Matt just sings "Jingle Bells" with the girls, but this year he performed a vocal solo of "Santa Claus is Coming to Town" using a different accent for each verse. It was somewhat politically incorrect and completely hysterical. Lucy pulls up the video on my iPhone every chance she gets and it brings me to tears pretty much every time I watch it. After the program and our second annual Christmas Eve BBQ dinner (shipped straight from Texas), it was home to leave milk and cookies for Santa and go to bed. Christmas Day is one of the few times where I take hardly any photos. This is one of the only pictures I have from the day of Lucy wearing the fairy costume that was a gift from my mom (she put it on immediately upon opening it). It was a lovely, happy holiday though, despite the lack of photographic evidence. Ella's favorite gifts were her Nintendo DS and LEGO Creator set. Claire loved her jewelry box and fairy book. And Lucy was mostly just thrilled to rip open presents regardless of what was inside. And honestly, my kids loved staying in their pajamas all day more than anything else. It's one of the things they look forward to most about Christmas! The day after Christmas, we left Lucy with a sitter and headed into the city to see Annie on Broadway. And to end the year, we finally got a little bit of snow. It wasn't much, but it was enough to go sledding in the backyard and make snowballs with our new snowball maker (which was surprisingly effective!). I think this was the first time that Lucy actually enjoyed the snow. She loved screaming at the top of her lungs every time she went sledding down the hill with Matt. This week I also got to go into Ella's classroom and help out with the class holiday party. Somehow I have managed to be in charge of doing a holiday craft in Ella's class every single year since kindergarten. In September, parents usually sign up to help out with celebrations throughout the year, and I always tell the teacher that I will fill in any open slots. It appears that holiday craft volunteers are hard to come by in our neck of the woods. I actually love being in the classroom, but trying to come up with a holiday craft is usually a bit stressful for me. This year my process went something like this: 1) Spend hours searching for ideas on Pinterest, 2) Choose a really adorable but overly elaborate project for a classroom full of 23 second graders, 3) Go to Michael's to buy supplies and become completely overwhelmed, and 4) Decide to take the easy way out and end up buying boxes of pre-made gingerbread men for the kids to decorate instead. When it was all said and done, the cookie decorating was a huge hit and I was amazed at how creative the kids were. I love that Ella wore a Santa hat to school for the entire week leading up to the holiday break. Claire told Santa that she didn't know what she wanted for Christmas. Santa replied that he couldn't fit "I don't know" in his bag, but asked if it would be okay to surprise her with something special. She agreed that it was a good plan. It was a mostly quiet December week around here, at least until The Elf Emergency of 2012 occurred. On the day Buddy created this M&M message for the girls (by the way, you should know that Buddy steals all his ideas from other elves posting on Facebook and Pinterest), Lucy touched him. Anybody who is familiar with Elf on the Shelf lore knows that an elf loses its magic if touched. As soon as it happened, Ella burst into tears. I suggested writing a letter to Santa to explain the situation and she got right to work. Since Buddy would not be able to fly back to the North Pole that night to report to Santa, she made sure to include her own report on "Thursday's attitude." Note that the only person she gave a smiley face to was herself. In order to speed the process along, I also sent Santa an e-mail and he had some "Magic Elf Dust" (thank you Google) waiting for us in our mailbox the next day, so all was right in the world again. On Saturday, Ella headed into New York with her good friend Will and his family to see the Christmas Spectacular at Radio City, so I promised Claire and Lucy we would do something fun at home. Baking cookies seemed to fit the bill. Ella even got home in time to decorate a few herself. Matt strings lights on our second tree of the season. Saturday was also the day we brought home Christmas tree #2. A couple of days after we chopped down our first tree, we somehow forgot to water it for 48 hours and it never really recovered from the neglect. It probably would have hobbled along until Christmas, but Matt determined that we should just cut our losses and get another one before things got any worse. So we undecorated tree #1 and hauled it outside, then headed down to a local nursery to pick out a replacement. When Ella got home from the Christmas Spectacular she immediately declared that she hated the new tree, and although my sentiments weren't quite as strong, I have to admit that I really missed the original too. The director of Claire's ballet studio arranged an outing to see a performance of The Nutcracker by the New York City Ballet, so I turned it into a mother/daughter outing. Claire on the subway platform. We rode the train into the city and then took the subway uptown. By the way, when you're patting yourself on the back for how well you know your way around New York, nothing humbles you like getting on the express train when you actually needed the local. Our first stop was brunch at The Smith. Claire got a buttermilk waffle and ate the entire thing, saving the whipped cream for last. Then it was time for the show. Afterward, Claire and I both gave it two thumbs up. Claire on the train ride home, wearing her Nutcracker souvenir. I let Claire pick out one souvenir each for herself and for both of her sisters. She chose a wooden nutcracker for Ella, and this tiara for herself and Lucy (even though I tried to direct her to an adorable mini snow globe instead). You don't want to know how much I paid for that tiara, but I tried to tell myself that it was all part of the experience. It wouldn't have felt like a trip into New York City if I didn't grossly overpay for something. Back at home this week, I managed to get the tree decorated. Our elf Buddy showed up, albeit a bit later than usual (Ella complained that several of her friends at school had elves who arrived last week). Buddy left a note explaining that he had been caught in "elf traffic," which seemed like a plausible excuse to the girls. All week he was up to typical elf antics such as getting into a tin of cookies and toilet-papering our tree. I spotted this sweet bookmark on Ella's nightstand. Heading off to school. Every day Lucy insists on taking a backpack with her in the morning just like the big girls. Inside the backpack is a lunch box. She follows me around the kitchen in the morning filling it up with every snack food item imaginable. The Santa letters have been written. This is Ella's. All Claire wants for Christmas is rosin (for her violin), a "fairy book" (even though she can't read them, she is obsessed with these somewhat insufferable Rainbow Magic books), and a charm bracelet, so Santa is going to have to be a bit creative. On Saturday, we went with the Shontzes on our 2nd annual Christmas tree hunt. It was absolutely freezing outside (a bit different than last year), and I couldn't feel my toes by the end, but we found our tree! Never mind that we managed to kill it within two weeks of getting it home by forgetting to water it, but I suppose that's a story for another blog post. Ella helps carry the tree to the car. Sunday: The day after everybody arrived, we headed north to Newport, Rhode Island. We broke up the drive by stopping in Mystic, CT for lunch. I thought Mystic Pizza would just be a tourist trap (there are TVs on almost every wall playing the movie on repeat), but it turns out that the pizza is actually really good. Among the under-10 crowd (on the left), it was mass chaos, while the teenagers (on the right) were engrossed in their media devices. Tuesday: This was a rest day. It was the one day that I decided to send Ella and Claire to school. Ella's class put on a short Thanksgiving play in which Ella played a pilgrim. She was not excited about her role because she thought she would have to wear a skirt. Thankfully she was able to perform in pants, and she was over the moon excited that her cousins from Utah stopped by to watch her. Wednesday: On the day before Thanksgiving, we headed into NYC to watch the balloons get inflated for the parade. We went early to try to avoid the biggest crowds and were worried that we wouldn't be able to see much, but were pleasantly surprised that most of the balloons were already blown up. Claire was enamored with the Hello Kitty balloon, which led off the parade this year, and was adamant that I properly document it. After seeing the balloons, we walked around the city. Pictures on the steps of a stranger's brownstone (always one of our favorite photo opportunities). Britney and Lucy. It was so fortuitous that we ended up having this reunion when we did, because Britney (the oldest of the cousins) will be leaving on an 18-month long church mission to Argentina in February. We wouldn't have had another opportunity to all get together until 2014. The ubiquitous Times Square shot. Katie, Britney, and Ella in front of Radio City. Cousins sitting on a curb in Rockefeller Center waiting to eat the Magnolia cupcakes we just purchased. This picture was taken about 20 seconds before we were asked not to sit on the curb. Once we relocated to the steps of St. Patrick's Cathedral, everyone was finally able to chow down. Thursday: On Thanksgiving, Matt's brother Thomas and his wife Melissa were gracious enough to host all 31 of us for dinner. Did I mention we all spent the night at their house that night as well? I'm not sure if they fully realized what they were getting themselves into, but we were grateful for the chance to be together under one roof. Notice how all of their plates consist mostly of rolls and Jello. Saturday: We made one more trip into the city to see The Lion King on Broadway. It was Claire's first show and she was thrilled to get a Lion King charm bracelet as a souvenir. Sunday: (This was technically part of Week 48, but I wanted to keep all the reunion photos together.) This was our last day together, and of course it wasn't until the very end that Lucy and her 3-year-old cousin Emalee discovered each other. Emalee told her mom, "I made a new friend!" Lucy said (of Emalee), "She's pretty cute." Matt had reunion shirts made for everyone similar to the ones he created for our last reunion to the Outer Banks. This time they were long-sleeved and said "NYC '12" on the front and "Giving Thanks, Woodbury Style" on the back. We all gathered for one last picture in our shirts before heading our separate ways. Who's ready to start planning the next reunion? So remember that election we had (doesn't it seem like a million years ago now)? These pictures are from that week and the following week. November 6th was Election Day, but I was so excited for it that it sort of felt a little bit like Christmas. I love politics. I hate the divisiveness and the negativity that inevitably tends to dominate the political landscape (and try really hard to steer clear of it), but I am passionate about many of the issues... and probably listen to and read far more political commentary than is considered healthy. I had many discussions with the girls about the political process leading up to Election Day, and we read a lot of books on the subject. My favorite was Grace for President, which I especially recommend for those with daughters. Be warned that I did cry at the end. After all that talk, I promised Ella and Claire they could stay up later than usual to watch some of the results come in. Of course, electoral map coloring pages were involved and the girls were really into it. Every time a projected winner was announced it was a mad dash to color in the correct state and write the number of electoral votes in the appropriate column. Unfortunately they only got to finish a small percentage of the map before heading to bed (one of the downfalls of living in the Eastern time zone). Town trick-or-treating had originally been rescheduled for the Wednesday after Sandy (Nov 7th), but due to another impending storm - this time a snow-bearing Nor'easter - it was canceled for a second time. Many neighborhoods took matters into their own hands and scheduled their own trick-or-treating for alternate dates. Our preferred trick-or-treating neighborhood (around the corner from us) had their festivities on Tuesday night, so we headed out into the freezing cold on Election Night to collect treats. Claire and Lucy gave up after only a few houses and stayed bundled up in the double stroller. Claire declared, "I am DONE. I have enough candy." Thank goodness for Ella's Halloween spirit (she would never allow such words to leave her lips). She literally sprinted from house to house without so much as a coat on, warmed solely by the thought of all that sugar piling up in her bag. The only time Lucy and Claire braved the cold was when Ella found a house that was giving out full-sized packs of Swedish Fish (smart girls). We did end up getting some snow on Wednesday night. It wasn't enough to cancel school on Thursday (which was quite a relief after already having had an entire week prior off for Sandy), but it was enough for a decent snowman. Claire and I built this guy together after she got home from school on Thursday. Ella helped put on the finishing touches after she got off the bus. Visiting day at Claire's preschool. I love getting a glimpse of how she spends her days. "Chocolate toast" (Nutella + toast) face. His and hers hurricane prep: In anticipation of Sandy's arrival Matt stocked up on non-perishables like beef jerky, while my main concern was making sure every device in the house was fully charged. This was hurricane week. We spent Sunday making last minute storm preparations, Monday at home waiting for the worst of the storm to hit, and Tuesday and beyond dealing with the aftermath and storm clean up. School was canceled for the entire week, and we were actually one of the only towns in the area that was able to open up schools the following Monday. I will admit that it was nice to all be home together with nowhere to go for a few days. Lucy took advantage of some extra cuddle time with Matt. When your four-year-old starts drawing pictures of a person in the middle of a hurricane, it's probably a sign that you're watching a bit too much news coverage. Cute and a little disturbing all at the same time. In all honesty though, the storm did cause some anxiety for the kids, especially Ella. Our town periodically made "Code Red" telephone calls to residents to update us on the storm, which I would put on speakerphone so both Matt and I could hear. I didn't think anything of it until I started noticing that Ella would cover her ears whenever we got one of those calls. The girls had a sleepover in the living room on Monday night because we didn't want them sleeping upstairs near the windows or in the potential path of falling trees. We thought it was inevitable that our power would go out for an extended period of time, considering we lost power for two days during Tropical Storm Irene last year and Sandy was a much stronger storm. At the height of the storm the winds were quite frightening, and as the evening wore on our lights did flicker off and on several times. Each time we thought the power was out for good, but then it would come right back on again. The lights were still on, but Lucy was out for the night. We were amazed to wake up on Tuesday morning with power, even more so after we checked online and saw that 92% of our town had no power. Then when we started seeing pictures of the devastation throughout the tri-state area, we honestly felt a little silly for escaping the storm unscathed. We were extremely grateful of course, but it honestly felt a bit ridiculous that so many people lost everything and yet we didn't even have to deal with the inconvenience of a cold shower. I will say that I am always really impressed with the way our town comes together in circumstances like these (sadly, since March 2010 this is the fourth instance of widespread and extended power outages and tree damage, although this was by far the worst). Our library was amazing, staying open late for device charging, offering movie marathons for the kids, and even organizing a potluck so those without power could enjoy a warm meal. Our YMCA opened up to the public for hot showers, and everybody who was lucky enough to have power was looking for a way to help those without it. We were happy that Matt's sister and family let us feel useful by providing them with dinner, baths and showers, and cousins to entertain their kids while they were out of power for several days. We just wished we could have done more for Matt's brother and family down in New Jersey who were without power for thirteen days. Although the coastal areas of our town experienced significant flooding, downed trees were the cause of most of the damage in our area. Enormous root beds like these from trees just toppling over were an extremely common sight all over. Utility trucks were another common sight. Utility and tree crews from all over the country came to help out with storm clean up (those trucks above came from Indiana). For me the most surprising - and frightening - effect of Hurricane Sandy was the shortage of gas. Things were especially bad in harder hit areas of New York and New Jersey, but the shortage eventually reached us up here in Connecticut as well. Matt and I even saw New York City taxi cabs that had made the 45 minute drive here just to fill up. By the end of the week all the gas stations in town were out of gas. It definitely made me think hard about how much we rely on gas, and how quickly things dissolve into mayhem when there isn't enough to go around. With the kids out of school for the week and trick-or-treating canceled (it honestly didn't even feel like Halloween on October 31st), I had to find creative ways to keep the kids entertained. Heading to Target and letting them each pick out a costume from the 70% off clearance rack seemed like as good an idea as any. Ella chose a pirate, Lucy picked a fairy, and that's Claire above all decked out as a Southern belle. In all seriousness however, we ended this week extremely grateful for the very basics: our home, heat, hot water, electricity, and most importantly our safety during the storm. This was the week where I tried to cram in all the Halloween I could before October 31st, because I had the sneaking suspicion that a storm named Sandy might just cancel trick-or-treating for us this year (by the way, my suspicion turned out to be spot on). On Friday I took Lucy to the town Halloween parade to trick-or-treat (see previous Halloween parades here: 2007, 2008, 2009). She was stubborn and preferred sitting in the stroller to collecting candy at the local shops. Sound anything like a recent pumpkin patch outing? The parade always ends at a park where the magician "Amazing Andy" performs. I think I have his whole routine memorized at this point, but it still manages to be pretty funny. It took a little while for Lucy to warm up, but eventually she sat down and seemed entertained by the show. Having her best buddy (and cousin) Will there helped. I couldn't find an actual Tinker Bell costume that I liked, but Claire approved of this Tinker Bell-inspired fairy outfit that I put together... except for the shoes. I thought she could just wear her silver ballet flats but was informed that no, Tinker Bell wears "green shoes with white balls on top." Sure enough, when I Googled Tinker Bell, there she was wearing green shoes with white pom poms. So I ended up having to buy the official Disney light-up Tinker Bell shoes, which Claire wore nonstop around the house for weeks even though I accidentally bought them a size too small. 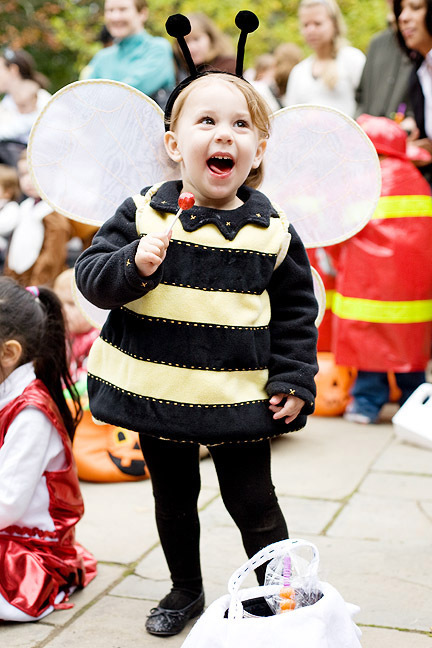 I was originally planning to have Lucy wear the bee costume Ella wore when she was two years old, but when I tried it on Lucy a few weeks before Halloween it was clear that she wanted nothing to do with it no matter how hard I tried talking it up. She loves dressing up like a "prin-sense" so I found this witch costume at Target and told her she was going to be a "princess witch." She loved it. The best part about this costume was when you asked her if she was a good witch or a bad witch. She always answered definitively: "a BAD witch!" A quiet week. Just a few pictures and even fewer words. It's looking a lot like fall. Most nights after the girls go to bed, I will hear the faint sound of rustling pages and when I go to inspect I will see this at the top of the stairs. I purchased Ella a reading light so she could read in bed, but for some reason she prefers to sit on the hardwood floor in the hall outside her doorway. I always tell her not to stay up too late, but I secretly love it when she does this. Bagel love. A bagel with cream cheese is pretty much all Ella and Claire will eat for lunch, so Lucy and I are always stocking up at Costco.